I’m proud to announce my new Kickstarter with writer Tevis Thompson! 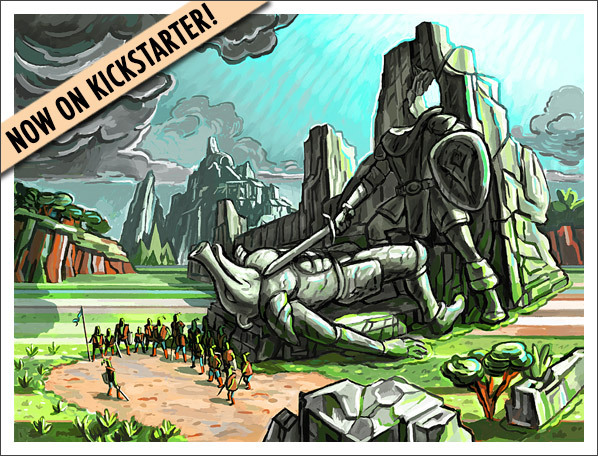 It’s called Second Quest, and it’s a comic book inspired by Zelda. It’s an original story about a young woman from a small town in the sky who begins to suspect that the legends about her home aren’t true. Please visit our Kickstarter page to learn more! We launched this morning and we’re off to a fantastic start. Thank you to everyone who is jumping on board, and spreading the word! Leading up to this thrilling and terrifying moment we have received so much encouragement and good council. We could not have dreamed up more talented and generous friends. There are a few people I want to mention specifically who made huge material differences to our project. Ryan O’Donnell of Area 5 directed, shot, and edited our video, which is the most important part of our appeal. He is a close friend who totally got what we’re trying to do and knew just how to articulate the story in video form. He made time in an incredibly busy schedule and the result is just awesome. Shawne Benson and Timothy Gregory composed the music that appears in the video. Their compositions perfectly convey the emotion of the story, our fondness for the old games and our excitement about this new thing we are creating. They worked fast and in good spirits and we couldn’t be doing this without them. Greg Rice is a close friend and one of the top Kickstarter experts. He consulted on numerous occasions, providing invaluable insight for our tiers and other big decisions. He also made some very important introductions. So thanks Greg! Just a few others I would be remiss not to mention are Tyler Thompson, Ellen Zhou, David Malki, Ryan North, Aaron Diaz, Cory Schmitz, Jonathan Blow, Steph Thirion, Ron Carmel, Aaron Isaksen, Nathan Vella, Casey Muratori, Bret Victor and Raber Umphenour. And of course there are others still who offered their thoughtful attention in person and over email. Thanks so much!